Transient receptor potential channel C6 (TRPC6) gain-of-function mutations and increased TRPC6 expression in podocytes induce glomerular injury and proteinuria. Sildenafil reduces TRPC6 expression and activity in nonrenal cell types, although the mechanism is unknown. Peroxisome proliferator–activated receptor γ (PPAR-γ) is a downstream target of sildenafil in the cyclic guanosine monophosphate (cGMP)–activated protein kinase G (PKG) axis. PPAR-γ agonists, like pioglitazone, appear antiproteinuric. We hypothesized that sildenafil inhibits TRPC6 expression in podocytes through PPAR-γ–dependent mechanisms, thereby counteracting podocyte injury and proteinuria. Treatment with sildenafil, the cGMP derivative 8-bromoguanosine 3′,5′-cyclic monophosphate sodium salt (8-Br-cGMP), or pioglitazone dose-dependently downregulated podocyte injury-induced TRPC6 expression in vitro. 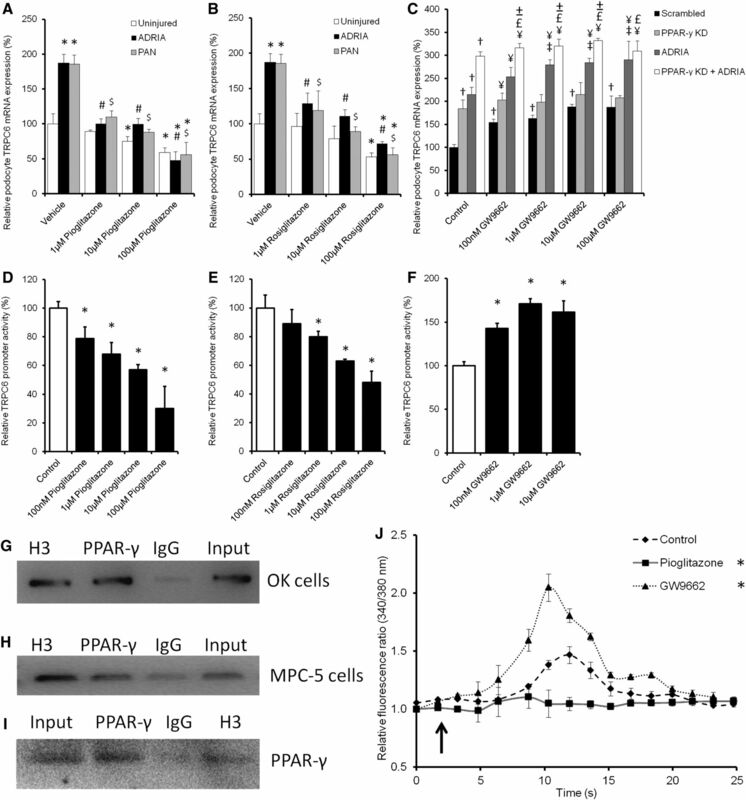 Knockdown or application of antagonists of PKG or PPAR-γ enhanced TRPC6 expression in podocytes and counteracted effects of sildenafil and 8-Br-cGMP. We observed similar effects on TRPC6 promoter activity and TRPC6–dependent calcium influx. Chromatin immunoprecipitation showed PPAR-γ binding to the TRPC6 promoter. Sildenafil or pioglitazone treatment prevented proteinuria and the increased TRPC6 expression in rats with adriamycin-induced nephropathy and mice with hyperglycemia-induced renal injury. Rats receiving PPAR-γ antagonists displayed proteinuria and increased podocyte TRPC6 expression, as did podocyte-specific PPAR-γ knockout mice, which were more sensitive to adriamycin and not protected by sildenafil. Thus, sildenafil ameliorates podocyte injury and prevents proteinuria through cGMP- and PKG-dependent binding of PPAR-γ to the TRPC6 promoter, which inhibits TRPC6 promoter activity, expression, and activity. Because sildenafil is approved for clinical use, our results suggest that additional clinical study of its antiproteinuric effect in glomerular disease is warranted. Sildenafil, also known as Viagra, was originally developed to treat angina pectoris and systemic hypertension. However, the first clinical trials were disappointing, and currently, sildenafil is primarily used to treat erectile dysfunction as well as pulmonary arterial hypertension. In this study, we explore the mechanism of a potential antiproteinuric effect of sildenafil in glomerular disease. One of the possible transcriptional targets of PPAR-γ is the Transient Receptor Potential Channel C6 (TRPC6), a nonspecific calcium (Ca2+)–conducting ion channel that is expressed in pulmonary vascular and penile corporal smooth muscle cells but also, renal glomerular podocytes.5,6 Gain-of-function mutations in TRPC6 lead to FSGS, which is characterized by podocyte foot process effacement, proteinuria, and eventually, ESRD.7,8 Importantly, we and others have shown that, in acquired human and experimental glomerular diseases, TRPC6 expression in the podocyte is increased.9–11 Podocytes are glomerular epithelial cells covering the outside of the glomerular capillaries with their intertwined foot processes, thereby creating a sieve or slit diaphragm in the glomerular filtration barrier. Ca2+ influx through TRPC6 activates several pathways in the podocyte, including the deleterious feed-forward calcineurin/NFAT pathway, which decreases expression of slit diaphragm-associated proteins, such as nephrin, and induces podocyte injury and eventually, proteinuria.12–14 Hall et al.15 previously showed that PKG affects TRPC6 phosphorylation at Thr69 in podocytes, which reduces TRPC6 functional channel activity. In addition, pretreatment of podocytes with a PKG agonist or a PDE5 inhibitor decreased TRPC6 Thr69 phosphorylation and inhibited TRPC6–dependent podocyte motility. Importantly, it has been described that sildenafil, by activating PKG and PPAR-γ, affects TRPC6 expression in the pulmonary vasculature, which is relevant to its therapeutic effect in pulmonary hypertension, whereas a dominant negative TRPC6 mutant was recently shown to restore erectile dysfunction in diabetic rats.5,6 We hypothesize that sildenafil activates PPAR-γ and reduces TRPC6 expression in the podocyte, which may decrease proteinuria, thereby contributing to the suggested renoprotective action of sildenafil (Figure 1). Hypothesis that links sildenafil to TRPC6. Sildenafil inhibits PDE5A, thereby indirectly increasing cellular cGMP levels. cGMP signaling activates PKG-1 and subsequently PPAR-γ, which inhibits TRPC6 transcription and expression. This leads to reduced TRPC6 channel expression at the membrane of the podocyte, thereby reducing TRPC6–mediated Ca2+ influx and eventually, podocyte injury in the context of glomerular disease. We propose that this pathway can be modulated by blocking PKG-1 with KT5823, activating PPAR-γ with pioglitazone or rosiglitazone, or inhibiting PPAR-γ with GW9662. In this study, we determined whether sildenafil affects TRPC6 promoter activity, expression, and subsequently, TRPC6 channel activity and whether this is a PPAR-γ–dependent effect. In addition, we investigated if these effects also have an in vivo significance. Elucidating these signaling processes will reveal more mechanistic insights into sildenafil or PPAR-γ agonists as therapeutic agents that could ameliorate renal injury and proteinuria in patients. The expression of PDE5A in podocytes, which plays a central role in our hypothesis (Figure 1), was not previously described. Cultured immortalized mouse podocytes (MPC-5) and mouse kidney cortex express PDE5A mRNA (Figure 2A). Western blot analysis of protein extracts of MPC-5 cells and mouse cortex also revealed PDE5A protein expression (Figure 2B). Moreover, PDE5A is expressed in glomeruli, and importantly, costaining with synaptopodin confirms PDE5A expression in podocytes in vivo (Figure 2C). PDE5A is expressed by podocytes. RNA and protein were isolated from cultured podocytes and renal mouse cortex; subsequently, (A) PCR and (B) Western blot were performed to determine PDE5A expression in these samples. Glomerular PDE5A expression was confirmed by immunofluorescence staining of PDE5A. (C) Importantly, costaining with synaptopodin showed PDE5A expression in the podocytes; merge is a higher magnification of single-channel images. AB, antibody; NTC, no template control. We addressed our proposed hypothesis (Figure 1) by exposing adriamycin– or puromycin aminonucleoside (PAN)–injured MPC-5 immortalized mouse podocyte cultures to different concentrations of sildenafil or the cell-permeable cGMP–derivative 8-bromoguanosine 3′,5′-cyclic monophosphate sodium salt (8-Br-cGMP) with or without the PKG-1 inhibitor KT5823. TRPC6 expression in PAN and adriamycin-treated podocytes was increased compared with untreated control cells, which could be dose-dependently downregulated by sildenafil treatment (Figure 3A). The cell-permeable cGMP derivative 8-Br-cGMP also downregulated TRPC6 expression in injured podocytes (Figure 3B). The PKG-1 antagonist KT5823 and importantly, PKG-1 knockdown (KD; 83%±5% KD versus scrambled controls on the basis of quantitative PCR [qPCR] results) prevented downregulation of TRPC6 expression by sildenafil and 8-Br-cGMP in injured podocytes (Figure 3C). To confirm the mRNA data and determine TRPC6 localization, parts of the experiments were repeated, and cells were stained for TRPC6. Injury caused TRPC6 to be more expressed on the membrane compared with uninjured and injured cells treated with sildenafil (Supplemental Figure 1). A luciferase-based TRPC6 promoter activity assay was performed to determine whether the above-described effects were mediated by inhibition of TRPC6 transcription. Importantly, both sildenafil (Figure 3D) and 8-Br-cGMP (Figure 3E) inhibited TRPC6 promoter activity. Moreover, the PKG-1 antagonist KT5823 prevented the effects of both sildenafil and 8-Br-cGMP on TRPC6 promoter activity (Figure 3F). Evaluation of other TRPC channels in podocytes revealed expression of TRPC1 (Supplemental Figure 2A), TRPC2 (Supplemental Figure 2B), TRPC3 (Supplemental Figure 2C), TRPC5 (Supplemental Figure 2D), and TRPC7 (Supplemental Figure 2E). Apart from TRPC6, only TRPC1 expression was downregulated by sildenafil. Sildenafil dose-dependently downregulates TRPC6 expression via PKG-1 in injured podocytes by affecting TRPC6 promoter activity. Cultured podocytes, transfected with either PKG-1 or scrambled siRNA, were injured by adriamycin (ADRIA) or PAN application and treated with different concentrations of (A) sildenafil or (B) 8-Br-cGMP (C) with or without PKG-1 antagonist KT5823, and TRPC6 mRNA expression was determined. Opossum Kidney cells expressing a TRPC6 promoter luciferase construct were treated with the same concentrations of (D) sildenafil or (E) 8-Br-cGMP (F) with or without KT5823. Firefly-to-Renilla ratio was calculated and normalized for vehicle-treated cells; n=4–8 in at least two independent experiments. Statistical significance was determined using ANOVA followed by Bonferroni post hoc test. *P<0.05 versus control cells; #P<0.05 versus ADRIA-treated cells; $P<0.05 versus PAN-treated cells. Subsequently, it was determined whether the reduced transcription and expression of TRPC6 resulted in a reduced TRPC6–mediated Ca2+ influx. Podocytes, which were stably transfected with a scrambled or TRPC6 KD construct (89%±2% KD versus scrambled controls as determined by qPCR analysis), were pretreated with sildenafil and 8-Br-cGMP either with or without cotreatment with the PKG-1 antagonist KT5823. Thereafter, TRPC6–mediated 1-oleoyl-2-acetyl-sn-glycerolin–activated Ca2+ influx in the absence of aforementioned compounds was determined. Compared with nonpretreated control podocytes, significantly less Ca2+ influx was measured in podocytes pretreated with sildenafil or 8-Br-cGMP, an effect that was prevented by inhibiting PKG-1 by pretreatment with KT5823 (Figure 4A). Importantly, in TRPC6 KD cells, Ca2+ influx was almost absent and was not influenced by any pretreatment regimen (Figure 4B). Downregulation of TRPC6 expression by sildenafil leads to reduced TRPC6–mediated Ca2+ influx into the podocyte. Intracellular Ca2+ concentration was determined by fura-2 ratiometry. Cultured podocytes transfected with a scrambled siRNA construct were pretreated with sildenafil or 8-Br-cGMP with or without the PKG-1 antagonist KT5823 for 24 hours. (A) After removal of the specific media, cells were exposed to 100 μM 1-oleoyl-2-acetyl-sn-glycerolin (OAG) to activate the TRPC6 ion channel. (B) The same experimental setup was tested in TRPC6 KD podocytes. The arrows indicate the time points of OAG application; n=5 in two independent experiments. Statistical significance was determined using a repeated measurement test. *P<0.05 versus vehicle-treated cells. To evaluate whether PPAR-γ activation is able to downregulate TRPC6 expression, mouse podocytes were treated with pioglitazone and rosiglitazone to activate PPAR-γ. Indeed, pioglitzone (Figure 5A) and rosiglitazone (Figure 5B) treatment inhibited PAN and adriamycin-induced TRPC6 overexpression. Moreover, when uninjured podocytes were transfected with PPAR-γ siRNA (86%±3% KD versus scrambled controls as determined by qPCR analysis) or treated with the PPAR-γ inhibitor GW9662, TRPC6 expression increased, which was additive to the upregulation caused by adriamycin and PAN (Figure 5C). To confirm mRNA data and determine TRPC6 localization, parts of the experiments were repeated, and cells were stained for TRPC6. Injury as well as inhibition of PPAR-γ caused TRPC6 to be more expressed on the membrane compared with uninjured and injured cells treated with pioglitazone (Supplemental Figure 1). Accordingly, a concentration-dependent inhibition of TRPC6 promoter activity by pioglitazone (Figure 5D) and rosiglitazone (Figure 5E) treatment was evident, whereas PPAR-γ antagonism with GW9662 increased TRPC6 promoter activity (Figure 5F). Importantly, using a chromatin immunoprecipitation (ChIP) assay, it could be shown that PPAR-γ directly binds to the TRPC6 promoter using a TRPC6 promoter construct transfected into Opossum Kidney cells (Figure 5G) as well as the endogenous TRPC6 promoter in cultured podocytes (Figure 5H). In the ChIP experiment concerning the endogenous TRPC6 promoter, the presence of PPAR-γ protein could be confirmed in the samples pulled down with the anti–PPAR-γ antibody, the (positive control) antihistone H3, and the input using Western blot analysis (Figure 5I). The decreased TRPC6 expression due to PPAR-γ activation resulted in reduced TRPC6–mediated Ca2+ influx into podocytes (Figure 5J). In contrast, pretreatment with GW9662 enhanced the Ca2+ influx. Again, Ca2+ influx was almost absent and not influenced by pioglitazone or GW9662 pretreatment in TRPC6 KD podocytes (data not shown). No significant effects of pioglitazone and rosiglitazone treatment on expression of TRPC1 (Supplemental Figure 2A), TRPC2 (Supplemental Figure 2B), TRPC3 (Supplemental Figure 2C), TRPC5 (Supplemental Figure 2D), and TRPC7 (Supplemental Figure 2E) were found. PPAR-γ agonists and antagonists as well as PPAR-γ KD influence TRPC6 promoter activity, TRPC6 expression, and channel activity. Cultured podocytes were injured by adriamycin (ADRIA) or PAN application and treated with different concentrations of the PPAR-γ agonist (A) pioglitazone or (B) rosiglitazone, and TRPC6 mRNA expression was determined. (C) In addition, TRPC6 expression was determined in uninjured podocytes, transfected with scrambled or PPAR-γ siRNA, and treated with various concentrations of the PPAR-γ antagonist GW9662. A luciferase assay was performed to determine TRPC6 promoter activity in Opossum Kidney cells treated with (D) pioglitazone, (E) rosiglitazone, and (F) GW9662. TRPC6-to-GAPDH and Firefly-to-Renilla ratios were calculated and normalized for vehicle-treated cells. ChIP assays were performed to determine whether PPAR-γ directly binds to the TRPC6 promoter. This was tested using (G) a promoter construct transfected into OK cells or (H) the endogenous TRPC6 promoter in cultured mouse podocytes. Antibodies against histone H3 (H3) as positive control, PPAR-γ to determine whether PPAR-γ bound to the TRPC6 promoter, and IgG as negative control were used to purify fractions of the DNA. (G and H) Hereafter, the proteins were digested, PCR was performed with primers detecting the TRPC6 promoter, and products were put on gel. (I) Western blot analysis showed that PPAR-γ was present in the input sample, in the PPAR-γ–immunoprecipitated sample, and in the H3-positive control sample of the nontransfected MPC-5 cells. Cultured podocytes stably transfected with scrambled siRNA were pretreated with sildenafil or 8-Br-cGMP with or without KT5823 for 24 hours. (J) After removal of the specific media, cells were exposed to 100 μM 1-oleoyl-2-acetyl-sn-glycerolin (OAG) to activate the TRPC6 ion channel. Intracellular Ca2+ concentration was determined by fura-2 ratiometry. The arrow indicates OAG application; n=4–8, in at least two independent experiments. Statistical significance was determined using ANOVA followed by (A–F) Bonferroni post hoc test or (J) repeated measurement test. *P<0.05 versus vehicle-treated uninjured cells; #P<0.05 versus ADRIA-treated cells; $P<0.05 versus PAN-treated cells; †P<0.05 versus scrambled transfected uninjured cells; ¥P<0.05 versus the GW9662 of equal concentration-treated scrambled cells; £P<0.05 versus the GW9662 of equal concentration-treated PPAR-γ KD cells; ±P<0.05 versus the ADRIA-challenged GW9662 of equal concentration-treated cells. 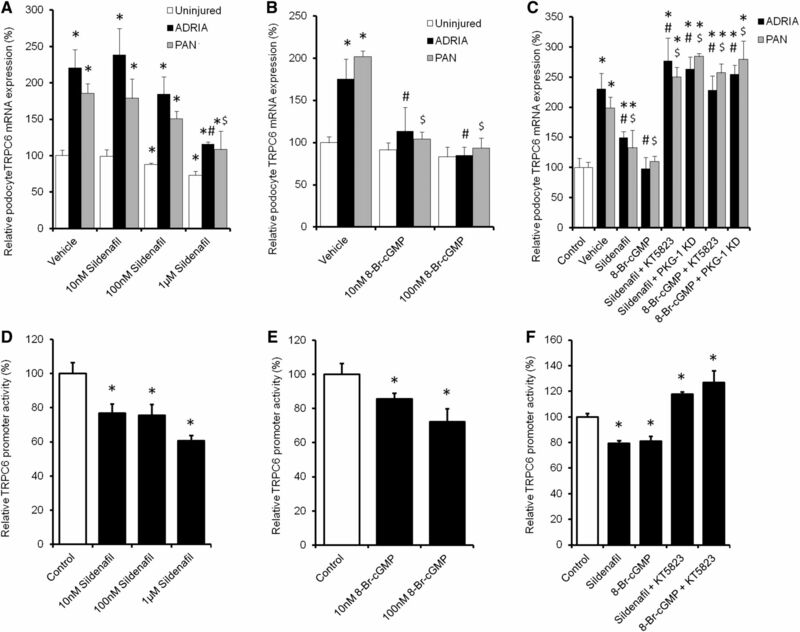 To determine the suggested role of PPAR-γ in the sildenafil- and cGMP-induced inhibition of TRPC6 promoter activity, expression, and functionality as shown above, PAN and adriamycin-injured podocytes transfected with PKG-1, PPAR-γ, or scrambled siRNA were treated with sildenafil, 8-Br-cGMP, pioglitazone, or rosiglitazone in combination with KT5823 or GW9662. 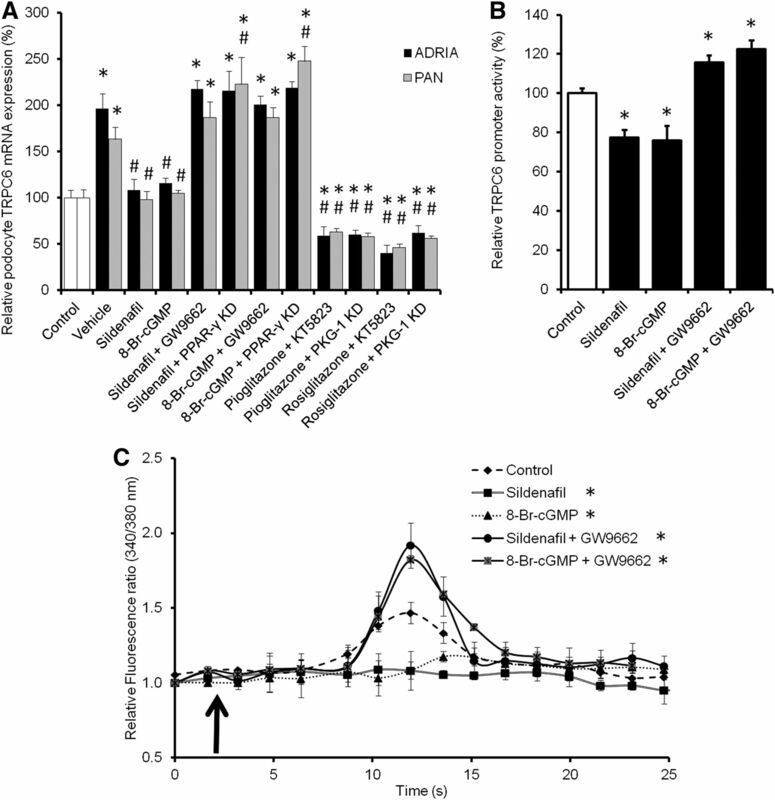 PPAR-γ KD and GW9662 treatment abolished the inhibitory effect of sildenafil and 8-Br-cGMP on TRPC6 expression in adriamycin- and PAN-injured podocytes (Figure 6A). Importantly, activation of PPAR-γ in combination with KT5823 treatment or in PKG-1 KD still podocytes downregulated TRPC6 expression after injury. Moreover, KD or inhibition of PPAR-γ in combination with adriamycin- or PAN-induced injury seemed additive, resulting in an even higher TRPC6 expression compared with control. To confirm mRNA data and determine TRPC6 localization, parts of the experiments were repeated, and cells were stained for TRPC6. Injury as well as inhibition of PPAR-γ caused TRPC6 to be more expressed on the membrane compared with uninjured cells, whereas activation of PPAR-γ during inhibition of PKG-1 led to a similar TRPC6 expression compared with uninjured cells (Supplemental Figure 1). In line with the above information, the effects of sildenafil and 8-Br-cGMP on TRPC6 promoter activity were also abolished when cotreated with GW9662 (Figure 6B). These TRPC6 transcriptional and expressional changes also had functional effects, because GW9662 pretreatment completely blocked the effects of sildenafil and 8-Br-cGMP on Ca2+ influx (Figure 6C). Again, 1-oleoyl-2-acetyl-sn-glycerolin–stimulated Ca2+ influx was virtually absent and unaffected by any pretreatment in TRPC6 KD podocytes (data not shown). PPAR-γ antagonism abrogates the effect of sildenafil on TRPC6 promoter activity, TRPC6 expression, and channel activity. Cultured podocytes, transfected with scrambled, PKG-1, or PPAR-γ siRNA, were injured by adriamycin (ADRIA) or PAN application and treated with sildenafil, 8-Br-cGMP, pioglitazone, or rosiglitazone with or without PPAR-γ antagonist GW9662. (A) Subsequently, TRPC6 mRNA expression was determined. (B) TRPC6 promoter activity was measured using a luciferase promoter assay in Opossum Kidney cells treated with sildenafil or 8-Br-cGMP with or without GW9662. Firefly-to-Renilla ratio was calculated and normalized for vehicle-treated cells. Cultured podocytes stably transfected with scrambled siRNA were pretreated with sildenafil or 8-Br-cGMP with or without GW9662 for 24 hours. (C) After removal of the specific media, cells were exposed to 100 μM 1-oleoyl-2-acetyl-sn-glycerolin (OAG) to activate the TRPC6 ion channel. Intracellular Ca2+ concentration was determined by fura-2 ratiometry. The arrow indicates the time point of OAG application; n=4–7 in at least two independent experiments. Statistical significance was determined using ANOVA followed by (A and B) Bonferroni post hoc test or (C) repeated measurement test. *P<0.05 versus vehicle-treated cells; #P<0.05 versus ADRIA-treated cells. To determine the in vivo role of PPAR-γ expressed by the podocyte in the regulation of TRPC6 expression, TRPC6 expression was determined in a podocyte-specific PPAR-γ knockout (KO) mouse model.16 Importantly, glomerular TRPC6 protein (Figure 7A) and mRNA (Figure 7B) expression was significantly increased in podocyte-specific PPAR-γ KO mice compared with wild-type littermates, which was accompanied by increased protein expression of the podocyte injury marker desmin (Figure 7C) and decreased protein expression of the central slit diaphragm protein nephrin (Figure 7D). Podocyte-specific PPAR-γ–deficient mice show increased glomerular TRPC6 expression. Glomerular TRPC6 (A) protein and (B) mRNA expression was determined. In addition, protein expression of (C) desmin and (D) nephrin was measured in podocyte–specific PPAR-γ–deficient (KO) mice as well as their wild-type littermates. Protein expression is depicted relative to the mean expression in wild-type mice; n=4 animals per group. Statistical significance was determined using an unpaired t test. Ctr, control. *P<0.05 versus wild-type littermates. To study whether pharmacologic inhibition of PPAR-γ also increases TRPC6 expression in vivo, Wistar rats were treated with different concentrations of GW9662 (0, 0.1, 1.0, or 10 mg/kg), and we determined TRPC6 expression (Supplemental Figure 3A) and proteinuria (Supplemental Figure 3B). After these dose-finding experiments, rats were treated with vehicle or the PPAR-γ antagonist GW9662 (2.5 mg/kg body wt) for 3 weeks. Indeed, immunofluorescence (Figure 8A) and mRNA expression (Figure 8B) analysis showed that GW9662 treatment increased glomerular TRPC6 mRNA and protein expression as well as desmin expression (Figure 8C), whereas nephrin expression was downregulated compared with in untreated control rats (Figure 8D). Rats treated with GW9662 showed a significantly increased urinary albumin-to-creatinine ratio (Figure 8E) and IgG (Figure 8F) excretion. Pharmacologic inhibition of PPAR-γ in rats increases glomerular TRPC6 expression and leads to podocyte injury and proteinuria. Wistar rats were treated with the PPAR-γ antagonist GW9662 (2.5 mg/kg body wt) for 3 weeks, after which animals were euthanized, and glomerular TRPC6 (A) protein and (B) mRNA expression was determined. In addition, protein expression of (C) desmin and (D) nephrin was measured. Protein expression is depicted as percentage relative to the mean expression in vehicle-treated rats. In addition, (E) urinary albumin-to-creatinine ratio (micrograms per millimolar) and (F) IgG-to-creatinine ratio (micrograms per millimolar) were assessed; n=4 animals per group. Statistical significance was determined using an unpaired t test. Ctr, control. *P<0.05 versus control rats. To evaluate whether the PPAR-γ agonist pioglitazone has renoprotective properties associated with regulation of TRPC6 expression in vivo, adriamycin nephropathy was induced in rats, after which treatment with pioglitazone (12 mg/kg body wt) was immediately started and continued for 6 weeks. Pioglitazone prevented upregulation of TRPC6 expression as determined by immunofluorescence analysis (Figure 9A) and qPCR (Figure 9B). 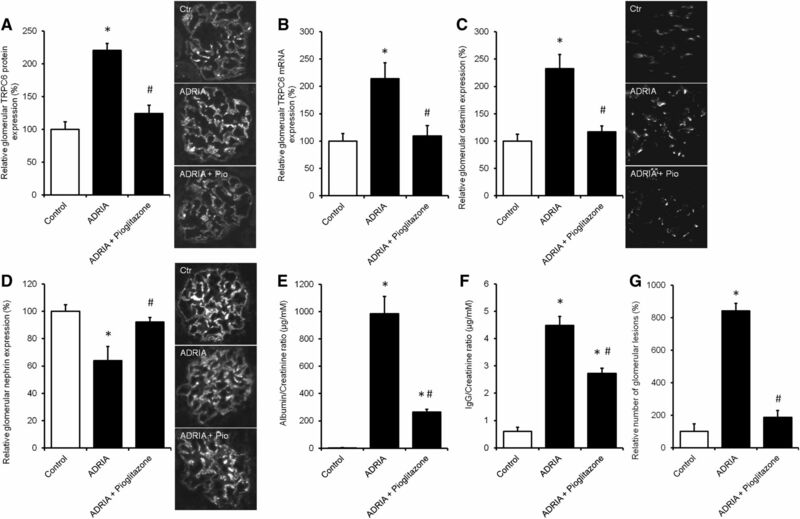 Glomerular desmin protein expression (Figure 9C) was also increased in adriamycin-induced nephropathy animals. Accordingly, nephrin expression was reduced in adriamycin-treated rats and normalized when these rats were treated with pioglitazone (Figure 9D). Adriamycin-exposed rats had an increased urinary albumin (Figure 9E) and IgG excretion (Figure 9F), which was remarkably ameliorated by pioglitazone treatment. Moreover, periodic acid–Schiff staining revealed that adriamycin increased the number of glomerular lesions, which was prevented by pioglitazone treatment (Figure 9G). Pioglitazone treatment prevents TRPC6 overexpression and podocyte injury in the adriamycin (ADRIA)–induced nephropathy rat model for FSGS. ADRIA-induced nephropathy was induced in rats, after which control and ADRIA nephropathy rats were treated with the PPAR-γ agonist pioglitazone (12 mg/kg body wt) for 6 weeks. Thereafter, animals were euthanized, and glomerular TRPC6 (A) protein and (B) mRNA expression was determined. In addition, protein expression of (C) desmin and (D) nephrin was measured. Protein expression is depicted as percentage of vehicle-treated rats. In addition, (E) urinary albumin-to-creatinine ratio (micrograms per millimolar), (F) IgG-to-creatinine ratio (micrograms per millimolar), and (G) percentage of glomerular lesions were assessed; n=8 animals per group. Statistical significance was determined using ANOVA followed by Bonferroni post hoc test. Ctr, control. *P<0.05 versus vehicle-treated control rats; #P<0.05 versus ADRIA–treated control rats. To determine whether sildenafil treatment also inhibits injury-induced TRPC6 expression in vivo and has an antiproteinuric effect, adriamycin nephropathy was induced in rats followed by treatment with 5 mg/kg body wt oral sildenafil for 6 weeks. 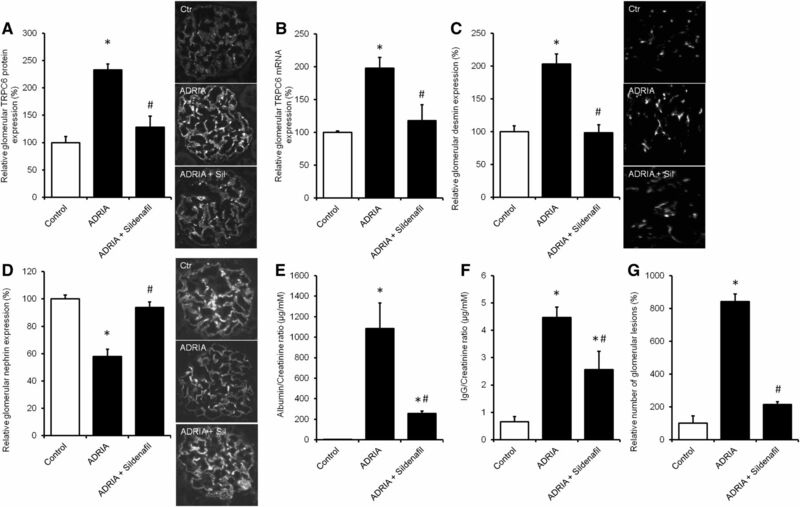 Adriamycin increased glomerular TRPC6 expression as determined by immunofluorescence analysis (Figure 10A) and qPCR (Figure 10B), which was accompanied by increased expression of desmin (Figure 10C) and a reduction of nephrin expression (Figure 10D). These expressional changes were all normalized by sildenafil treatment. Importantly, adriamycin treatment resulted in increased urinary albumin (Figure 10E) and IgG excretion (Figure 10F), which was significantly reduced by sildenafil exposure. Moreover, periodic acid–Schiff staining revealed that adriamycin increased number of glomerular lesions, which were prevented by pioglitazone treatment (Figure 10G). Sildenafil treatment prevents TRPC6 overexpression and podocyte injury in the adriamycin (ADRIA)–induced nephropathy rat model for FSGS. ADRIA-induced nephropathy was induced in rats, after which control and ADRIA nephropathy rats were treated with sildenafil (5 mg/kg body wt) for 6 weeks. Thereafter, animals were euthanized, and glomerular TRPC6 (A) protein and (B) mRNA expression was determined. In addition, protein expression of (C) desmin and (D) nephrin was measured. Protein expression is depicted as percentage of vehicle-treated rats. In addition, (E) urinary albumin-to-creatinine ratio (micrograms per millimolar), (F) IgG-to-creatinine ratio (micrograms per millimolar), and (G) percentage of glomerular lesions were assessed; n=8 animals per group. Statistical significance was determined using ANOVA followed by Bonferroni post hoc test. Ctr, control. *P<0.05 versus vehicle-injected control rats; #P<0.05 versus ADRIA–treated control rats. To determine whether sildenafil alone would deleteriously regulate TRPC6 expression or induce glomerular injury, healthy mice were treated with sildenafil. No difference was found between healthy mice treated with vehicle and sildenafil in TRPC6 protein (Supplemental Figure 4A), TRPC6 mRNA (Supplemental Figure 4B), desmin protein (Supplemental Figure 4C), and nephrin protein expression (Supplemental Figure 4D). To determine the significance of PPAR-γ in the in vivo effect of sildenafil, we determined TRPC6 expression and renal injury markers in adriamycin-injured vehicle- or sildenafil-treated podocyte-specific PPAR-γ KO mice. In contrast to wild-type mice, injury-induced glomerular TRPC6 protein (Figure 11A) and mRNA (Figure 11B) expression was not normalized by sildenafil in podocyte-specific PPAR-γ KO mice. Desmin expression showed a similar pattern (Figure 11C). 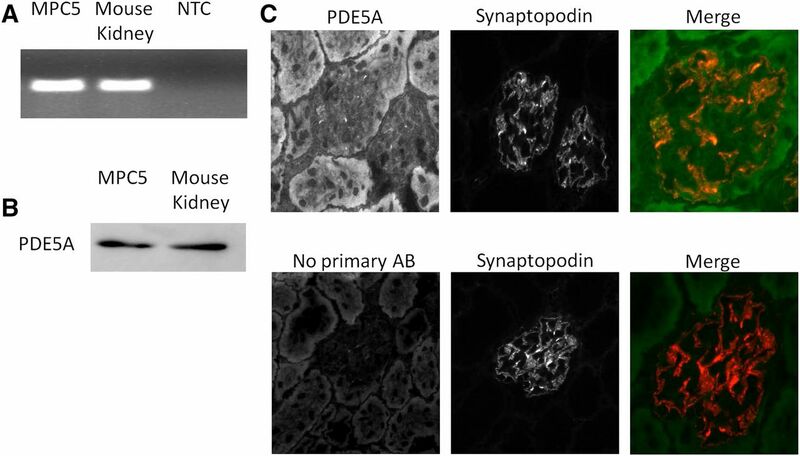 Nephrin expression was increased in sildenafil-treated adriamycin-challenged wild-type animals, whereas this was completely prevented in podocyte-specific PPAR-γ KO mice (Figure 11D). Albumin-to-creatinine ratio was only lowered by sildenafil in adriamycin-challenged wild-type mice but not in podocyte-specific PPAR-γ KO animals (Figure 11E). 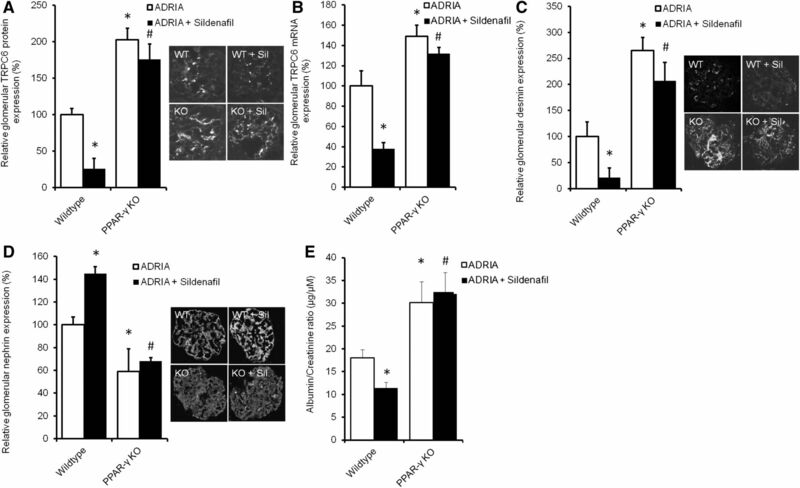 Sildenafil does not prevent TRPC6 overexpression and podocyte injury in adriamycin (ADRIA)–challenged podocyte-specific PPAR-γ KO mice. ADRIA-induced nephropathy was induced in podocyte-specific PPAR-γ KO and wild-type mice, after which they were treated with sildenafil. Thereafter, animals were euthanized, and glomerular TRPC6 (A) protein and (B) mRNA expression was determined. In addition, protein expression of (C) desmin and (D) nephrin was measured. Protein expression is depicted as percentage of vehicle-treated mice. (E) In addition, urinary albumin-to-creatinine ratio (micrograms per micromolar) was assessed; n=3–8 animals per group. Statistical significance was determined using ANOVA followed by Bonferroni post hoc test. WT, wild type. *P<0.05 versus vehicle-injected control mice; #P<0.05 versus ADRIA–treated control mice. 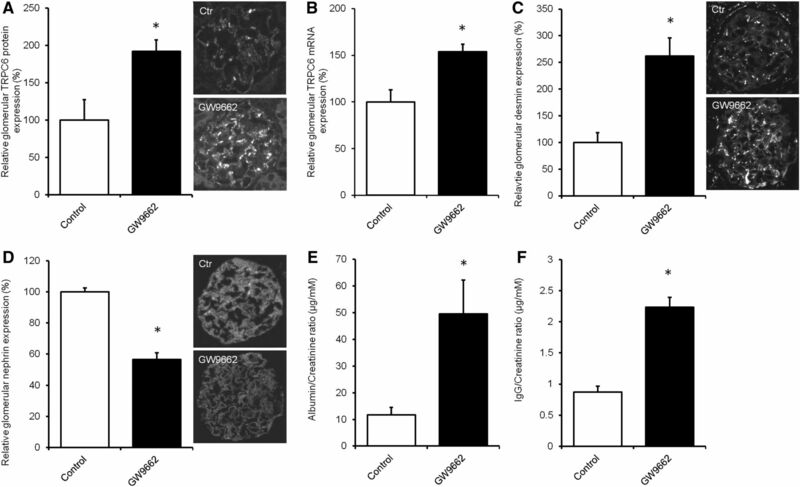 Apart from adriamycin nephropathy, we and others previously showed that increased TRPC6 expression accompanies glomerular injury in the streptozotocin (STZ)–induced diabetes model for diabetic nephropathy.11,17 To determine the protective role of sildenafil in another injury model, we used mice in which hyperglycemia was induced by STZ (Figure 12A). STZ–induced hyperglycemic mice were then treated with vehicle or sildenafil. Glomerular TRPC6 protein (Figure 12B) and mRNA (Figure 12C) expression was increased in vehicle-treated hyperglycemic mice compared with control normoglycemic mice. TRPC6 expression was normalized in sildenafil-treated littermates without significantly altering serum glucose levels. This was accompanied by a similar regulation of desmin expression (Figure 12D). Although nephrin expression was decreased in hyperglycemic mice, it was normalized by sildenafil treatment (Figure 12E). Albumin-to-creatinine ratio was increased in hyperglycemic mice, whereas treatment of hyperglycemic animals with sildenafil significantly ameliorated proteinuria. (Figure 12F). Sildenafil treatment prevents TRPC6 overexpression and podocyte injury in the STZ–induced hyperglycemic mouse model for renal injury. STZ-induced hyperglycemia was induced in healthy mice (STZ), after which animals were treated with sildenafil. Thereafter, animals were euthanized, and (A) serum glucose and glomerular TRPC6 (B) protein and (C) mRNA expression were determined. In addition, protein expression of (D) desmin and (E) nephrin was measured, and (F) urinary albumin-to-creatinine ratio (micrograms per milligram) was assessed. Protein expression is depicted as percentage of vehicle-treated mice; n=3–5 animals per group. Statistical significance was determined using ANOVA followed by Bonferroni post hoc test. *P<0.05 versus vehicle-injected control mice; #P<0.05 versus STZ-treated mice. This study shows that sildenafil reduces TRPC6 promoter activity and TRPC6 channel expression and thereby, prevents deleterious TRPC6–mediated Ca2+ influx in cultured podocytes. In addition, it could be shown that PDE5A is expressed by podocytes and that PPAR-γ (ant)agonism affects podocyte TRPC6 expression by modulating the binding of PPAR-γ to the TRPC6 promoter. Both loss of PKG-1 or PKG-1 inhibition and PPAR-γ KD or PPAR-γ antagonism inhibited the effects of sildenafil and cGMP on TRPC6 expression and activity in the podocyte. Therefore, we propose a mechanism of action in which a sildenafil-induced rise in cGMP levels activates PKG-1 and subsequently, PPAR-γ, which then directly binds to the TRPC6 promoter and downregulates its expression (as depicted in Figure 1). Activation of the suggested pathway, thereby inhibiting TRPC6–dependent Ca2+ influx, could contribute to podocyte viability and therefore, protect the glomerulus from injury. Indeed, both podocyte-specific PPAR-γ KO mice as well as rats treated with a PPAR-γ antagonist showed increased glomerular TRPC6 expression, signs of podocyte injury, and increased proteinuria. Importantly, both sildenafil and pioglitazone treatment prevented the increased TRPC6 expression in adriamycin nephropathy, a model for human FSGS. In addition, sildenafil downregulated TRPC6 expression in a hyperglycemic mouse model that induces renal injury. This was in both models accompanied by a reduction in podocyte injury and amelioration of proteinuria. Renoprotective effects of sildenafil were suggested before, albeit mainly in an ischemia-reperfusion model.18–20 The effects of sildenafil in ischemia-reperfusion were postulated to involve vascular effects, because dilation of afferent arterioles, for instance, promotes a transient increase in glomerular filtration in renal transplant recipients receiving a single dose of sildenafil. However, we could not detect TRPC6 in the renal vasculature, and our study provides preclinical proof of as well as a novel mechanism for a specific antiproteinuric effect of sildenafil mediated by PPAR-γ activation in the podocyte. Our data particularly show that sildenafil affects TRPC6 transcription and expression and thereby, alters TRPC6–mediated Ca2+ influx into the podocyte. A previous study by Hall et al.15 suggested that PDE5 inhibition induces phosphorylation of TRPC6 at Thr69 and thereby, inhibits channel function directly. This could, in turn, also affect TRPC6 expression. We have previously shown that TRPC6–dependent Ca2+ influx into the podocyte activates the calcineurin/NFAT pathway, which eventually increases TRPC6 expression.12 Therefore, direct inhibition of TRPC6 channel signaling could lead to TRPC6 downregulation via the latter mechanism. However, in this study, we have shown that sildenafil-dependent activation of PPAR-γ by PKG-1 plays a significant direct transcriptional role in the downregulation of TRPC6 expression. We could show effects of PKG-1 and PPAR-γ on TRPC6–mediated Ca2+ influx in the absence of sildenafil or 8-Br-cGMP. Moreover, pretreatment of podocytes with sildenafil or 8-br-cGMP did not significantly affect Ca2+ influx when combined with a PPAR-γ antagonist, which affects TRPC6 at the level of transcription. Therefore, we conclude that, in our in vitro system, the cGMP-PKG-PPAR-γ pathway seems to be more important in downregulating TRPC6 expression compared with a possible indirect effect through reduced TRPC6 channel function resulting from Thr69 phosphorylation. However, Thr69 phosphorylation might, that is, decrease the open probability of the TRPC6 channel in parallel to the discussed transcriptional and expressional effects. In this study, we did not determine TRPC6 phosphorylation, because our main focus was to unravel the mechanism of the suggested TRPC6 transcriptional downregulation via the cGMP-PKG-PPAR-γ pathway. A direct inhibition of TRPC6 channel function by sildenafil could, however, still contribute to its in vivo antiproteinuric effect by limiting the deleterious Ca2+ influx through TRPC6. In this manner, sildenafil could successfully interrupt deleterious TRPC6-mediated signaling in the podocyte at multiple levels. 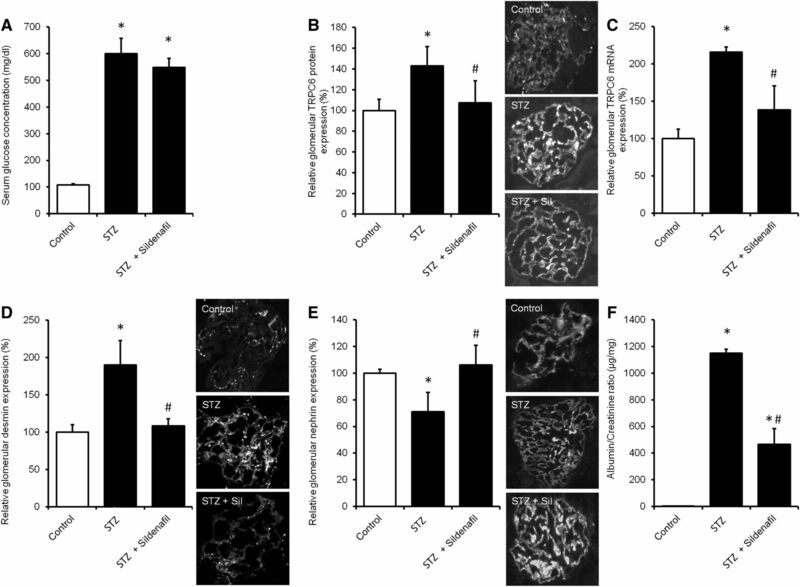 Sildenafil is currently used to treat pulmonary hypertension, where its main mechanism of action has been described to reduce intracellular Ca2+ levels in pulmonary arterial smooth muscle cells, leading to vasorelaxation in the pulmonary vasculature.21 Recently, it was also shown that, in these cells, sildenafil inhibits TRPC6 expression, which could be prevented by application of a PKG-1 or PPAR-γ inhibitor.22 In this way, sildenafil prevented hypoxia-induced TRPC6 and TRPC1 expression, which led to vasoconstriction, in pulmonary arterial smooth muscle via the same cGMP-PKG-PPAR-γ axis. TRPC1 expression in podocytes was previously shown; thus, its downregulation by sildenafil could be relevant. However, currently, the (patho)physiologic role of TRPC1 in the podocyte is unknown. In addition, we previously showed that angiotensin II blockade, angiotensin receptor blockade, high glucose, and adriamycin administration, which are all relevant in the context of this study, did not affect TRPC1 expression in the podocyte.11 Very recently, the clinical antiproteinuric effect of PDE5A inhibition in albuminuric patients with diabetes was shown in analogy to our experiments in hyperglycemic mice.23 Our data are the first to show that the cGMP-PKG-PPAR-γ-TRPC6 pathway plays a role in the beneficial effect of sildenafil in not only pulmonary hypertension but also, proteinuric diseases. Our in vivo data showed that treatment with the PPAR-γ agonist pioglitazone normalized TRPC6, desmin, and nephrin expression and ameliorated proteinuria in adriamycin nephropathy. The antiproteinuric effect of pioglitazone has been previously shown in adriamycin nephropathy as well as human proteinuric disease, and several hypotheses on the podocyte-protective effect of PPAR-γ were postulated.24,25 Among these were antiapoptotic effects and blockade of angiotensin production as well as improved mitochondrial function reducing the level of reactive oxygen species.26–29 Importantly, we and others described the role of angiotensin and local angiotensin production by the podocyte in the regulation of TRPC6 expression during podocyte injury.12,30 Of note, TRPC6–mediated Ca2+ influx has previously been linked to podocyte apoptosis and reactive oxygen species production.29,31 Thus, identification of TRPC6 as a direct PPAR-γ target in the podocyte could also provide a mechanistic link between PPAR-γ agonists and their previously described effects on oxidative stress and cell fate. It was previously determined that the podocyte-specific PPAR-γ KO mice are particularly susceptible to podocyte injury by adriamycin or nephrotoxic serum.16 This predisposition is reminiscent of the apparent podocyte susceptibility that leads to late-onset FSGS in patients with TRPC6 gain-of-function mutations.7,8 The potential of PPAR-γ agonists as treatment modalities for several renal diseases, such as diabetic nephropathy, was already previously shown.32 Beneficial effects of PPAR-γ were suggested in tubular epithelial cells as well as glomerular mesangial cells, endothelial cells, and podocytes in the context of diabetic nephropathy.33–35 Importantly, we showed that podocyte-specific absence of PPAR-γ prevents the renoprotective effect of sildenafil in the adriamycin nephropathy model. Therefore, activation of PPAR-γ could be crucial in the treatment of glomerular diseases, such as FSGS. In conclusion, we have shown that in vitro as well as in vivo treatment with a PDE5 inhibitor or PPAR-γ agonist downregulates TRPC6 expression, reduces podocyte injury, and ameliorates the associated proteinuria. Amelioration of podocyte injury by sildenafil seems to involve stimulation of cGMP- and PKG-dependent binding of PPAR-γ to the TRPC6 promoter, thereby inhibiting TRPC6 promoter activity, TRPC6 expression, and ultimately, channel activity. In vivo, blocking this cGMP-PKG-PPAR-γ pathway induces proteinuria, whereas its stimulation by sildenafil and pioglitazone treatment reduces glomerular injury and proteinuria. These data identify sildenafil as a promising novel antiproteinuric agent, which acts by inhibiting deleterious TRPC6–mediated intracellular podocyte signaling. Mice, 12–14 weeks of age, with a podocyte-specific deletion of PPAR-γ were created using the NPHS2-Cre recombinase (podocin-Cre) mouse.16 Podocyte-specific disruption of PPAR-γ alleles was achieved by crossing podocin-Cre–positive mice with the B6.129S6-Ppargtm1.1Mgn/Mmmh strain obtained from the Mutant Mouse Regional Resource Center at the University of Missouri (stock no. 012035-MU) on a C57BL6/J background. Mice were challenged with adriamycin and treated for 3 weeks with vehicle or sildenafil. Wild-type littermates were used as age-matched controls. Hyperglycemia was induced in 12-week-old CD1 mice by a single injection of STZ (150 mg/kg) as described before.36 A drop of tail blood was used to monitor glucose concentrations with the MediSense Precision Plus Kit (Abbott Diagnostics, Melbourne, VIC, Australia). After the development of hyperglycemia, mice were treated for 3 weeks with vehicle or sildenafil. Adriamycin nephropathy was induced in Wistar rats (Charles River Laboratories, Wilmington, MA), and animals were treated with sildenafil or pioglitazone for 6 weeks, or GW9662 for 3 weeks. After treatment, rats were housed in metabolic cages for 24 hours; thereafter, urine, blood, and kidneys were collected. Urinary albumin, IgG, and creatinine concentrations were determined. All animal procedures were approved by the Animal Ethics Committee of the Radboud University, the Institut National de la Santé et de la Recherche Médicale Local Ethic Review Board at Paris Descartes University, and the Sapienza University’s Animal Research Ethics Committee (165/2016-PR) in accordance with the guidelines of the Dutch, French, and Italian Council for Animal Care and the European Communities Council Directive (86/609/EEC). Conditionally immortalized mouse podocyte (MPC-5) cells were cultured as described previously.37 Differentiated cells were injured using adriamycin or PAN in combination with transfection with scrambled, PPAR-γ, or PKG-1 siRNA using Dharmafect (GE Lifesciences) and treated with vehicle or indicated concentrations of sildenafil, pioglitazone, rosiglitazone, 8-Br-cGMP, KT5823, or GW9662 (Sigma-Aldrich, St. Louis, MO). Parts of the experiments were performed in TRPC6 KD cells as described previously.11 The TRPC6 promoter activity assay was performed as described previously.10 Intracellular Ca2+ was visualized using fura-2 fluorescent Ca2+ as previously described.11 MPC-5 cells were fixed and stained for TRPC6. Then, TRPC6 expression and cellular localization were studied. ChIP was performed according to the manufacturer’s protocol. Opossum Kidney cells were transfected using lipofectamin with TRPC6 promoter construct, and untransfected podocytes were treated with pioglitazone, after which a ChIP was performed (Magna ChIP A Chromatin Immunoprecipitation Kit; Upstate Millipore) using an antibody directed against PPAR-γ (Santa Cruz), an appropriate isotype control, and a positive control, an antibody directed against histone H3. The enrichment of the TRPC6 promoter compared with the isotype control was evaluated using real-time qPCR with specific primers corresponding to the TRPC6 promoter region. Subsequently, an immunoblot of all samples was done to determine PPAR-γ (Santa Cruz) expression in the input and immunoprecipitated samples. RNA was isolated from kidney cortex or cultured MPC-5 cells for real-time PCR. Glyceraldehyde-3-phosphate dehydrogenase was used as the housekeeping gene. Protein extracts from kidney cortex or MPC-5 cells were resolved by SDS-PAGE and blotted on a PVDF membrane. After blocking and incubation with the appropriate first and second horseradish peroxidase-labeled antibodies, the blot was analyzed using chemiluminescence. All results are depicted as mean±SEM. Paired t test or ANOVA was used to test for significance using SPSS software (IBM, New York, NY) followed by a Bonferroni post hoc test. P values <0.05 were considered significant (Supplemental Material). We thank Prof. Dr. Jochen Reiser (Rush University Medical Center, Chicago, IL) for providing mouse podocyte cell lines. This work was financially supported by Ruby Diabetes Research Grant 2009.80.118 from the Dutch Diabetes Fund (to T.N. ), a grant from the Genzyme Renal Innovations Program, and Senior Kolff Career Stimulation Grant 13OKS023 from the Dutch Kidney Foundation (to T.N.). This work was also supported by Dutch Organization for Scientific Research Nederlandse Organisatie voor Wetenschappelijk Onderzoek (NWO) Vici grant 016.130.668 (to J.G.H.). See related editorial, “The Use of Sildenafil for Glomerular Disease,” on pages 1329–1331. This article contains supplemental material online at http://jasn.asnjournals.org/lookup/suppl/doi:10.1681/ASN.2015080885/-/DCSupplemental.